Epilepsy surgery. Who can have surgery? Common Questions about Epilepsy Surgery What happens the day before surgery? Anaesthetic Assessment: Children will be seen by the anaesthetist for an assessment. The anaesthetist will discuss the anaesthetic history of the child with their parents. The anaesthetist will also answer any questions and in particular will go through the post operative pain management plan for the child. Fasting Prior to Surgery: The anaesthetist will instruct the parents about the fasting times for the child. Usually children have nothing to eat or drink from midnight on the day of surgery. Medication: Children should take their anti-epileptic medication at approximately 06:00am. This will be confirmed by the anaesthetist. The child may take their tablets with a very small amount of clear fluid (i.e. water). MRI Scan: Children who do not require an anaesthetic for an MRI scan, will usually have their neurosurgical pre-operative MRI scan on the evening before surgery. Children who require an anaesthetic will have the pre-operative MRI scan on the morning just prior to surgery, as part of their anaesthetic. The Night Before Surgery: If families live a significant distance from the hospital, it is recommended that they stay close to the hospital the night prior to surgery. Admission time is usually 07:00am. What happens on the day of surgery? The child and parents are required to present to the Surgery Reception J, Level 3, East Building (via the Yellow Lifts), at 07:00am for admission. Epilepsy surgery usually takes most of the day. The anaesthetist or neurologist will phone parents with updates during the operation. Families are encouraged to go out of hospital or to the Family Resource Centre, as it can be a very long day. The doctors will notify you when the surgery is almost finished and usually request to meet you in the theatre waiting room after surgery. When the child is awake, parents will be shown into the recovery unit to be with them. Facial Swelling: Most children will have some degree of facial swelling after surgery. Some children develop “black eyes” and have one or both eyes swollen shut. Swelling is normally at its worst 24-72 hours after surgery. After then, the swelling will gradually subside. Parents staying at the bedside after surgery and visitors: One parent or carer is able to stay at the child’s bedside overnight. During the day, parents are free to visit at any time, however extended family and friends should visit as per the visiting hours set out on the 4th Floor- Cockatoo ward. We ask families to be aware that children will become tired very easily in the first few days post surgery, and will require day time sleeps. Families should also be conscious of other patients and their families when discussing visitors for their child. Discharge home after surgery: How long will my child stay in hospital? Children usually stay in hospital for 5-7 days after surgery, as per the neurosurgical team. Melbourne families are discharged home. Interstate families are discharged to their local accommodation. Interstate children are required to stay in Melbourne for approx 2-3 weeks after surgery. Children are reviewed by the neurosurgeon two weeks after surgery. Children who are to fly home after the surgery will require a head CT scan to check if there are able to fly. What wound care is required? Nursing staff will give the parents alcohol wipes prior to discharge from the ward, along with an instruction leaflet about how to care for the wound at home. The white head dressing stays in place, and dry for 10 days after surgery. On day 10, it can then be removed by parents, and children may wash their hair. The wound will be checked by the neurosurgeon at the two week post operation review appointment. What activities are allowed after epilepsy surgery? Skull Bone Healing: Children who have had brain surgery need time for their skull bones to heal. This is similar to someone who has had a broken arm or leg, where it will take 6-8 weeks for bones to heal. The skin wound will heal in a few weeks. A helmet is not usually required. Adequate Rest Time: Children may continue to be tired and require day time rests for a couple of weeks after surgery. Parents should monitor their child and allow for adequate rest, limiting visitor numbers and duration of visits. Encouraging quieter activities initially like reading, board games, drawing, puzzles, DVD’s etc., is recommended. Returning to School/ Day care: Children usually return to school/ day care 2-3 weeks after surgery, initially for only half days (again due to tiredness), gradually increasing the time spent at school/ day care over the following 2 weeks. By week 4 after surgery, children should have returned to their normal routine. 2 MONTHS All contact sports: i.e. : football, rugby, soccer, netball, basketball, martial arts Other Sports/activities: rock climbing, gymnastics, trampolining, tennis, horse riding, playing on monkey bars, go-carting, bike riding. 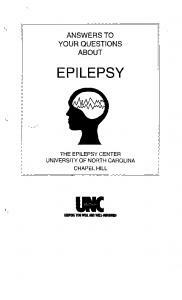 Report "Common Questions about Epilepsy Surgery"